The Part Status Box appears in the top right of every part page. It provides a summary of a part's status within the Registry and the Registry's Repository. Get This Part: The Get This Part page will show you the location of a sample in the current distribution, or in the Repository. The Registry is introducing the concept of "Releasing a Part." This means that the author of the part says it is ready and important; its documentation and measurement are complete. The part status field will show if a part has been released.. As of May 2017, the part status system is not fully in place. Parts are released by submitters when they have met certain criteria for completeness. iGEM HQ will be releasing parts that were created before the introduction of the release system (2013). Parts that are either in progress or incomplete. Some parts have been discontinued as a way to prune the Registry's collection of parts. Many of these parts are old, poorly documented, and unused. At least one sample of the part exists in the Repository, and it has met our Quality Control criteria. The sample has been sequenced with a result of Confirmed or Long Part. It may be in the current distribution, or available by request. At least one sample of the part exists in the Repository, but it has not fulfilled our Quality Control criteria. The sample has been sequenced with a result of Single Base Error, Partially Confirmed, Inconsistent, or Bad Sequencing. The sample may not have been sequenced. There is no available sample for this part in the Repository. It cannot be requested. The part is strictly informational (BioBrick scar, primer sites, etc). As such, there is no available sample and it cannot be requested. The sample status defaults to BioBrick (RFC 10). However, if the sample of the part is in a standard other than BioBrick (RFC 10), the sample's standard will appears below the status. The experience status for a part, as documented by the part authors. However, the part's experience is not a validation of the part by iGEM HQ. Take a look at the part's main page and experience page to learn more about the community's experience with this part. The number of times the part has been specified in composite parts in the Registry. Click to see all of the uses of this part. 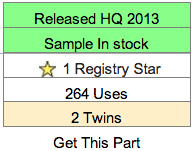 This section shows the number of twins the part has. Click to see all of the twins of this part. Two or more parts are twins if they have the same sequence. The Registry is phasing out twins. If you're adding a new part, it should not be a twin of an existing part. The Get This Part page will show you the location of a sample, if available, in the current distribution or in the Repository. Learn more about requesting parts.